The England squad did brilliantly and certainly brought the country together, look at all our foreign inhabitants who backed them as well as those born here. I will happily shout WELL DONE to those young England players and their Manager. So, here it is: the end point of the last month. A great tournament, not at all spoiled by the occasional wrestling and writhing. A final prediction, if I may be permitted (third-place play-offs in my opinion aren't genuine matches and FIFA should knock them on the head), and I cannot see past France for this one: they've been far and away the best team in all departments throughout. 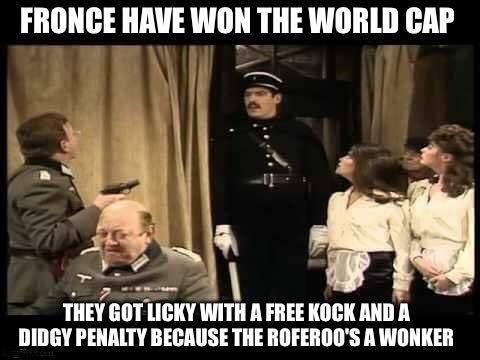 For those who like an in depth summing up the World Cup Final.